Smith Henderson gets it. There are a number of very good things about Henderson’s novel Fourth of July Creek, but by far the most significant is that his portrayal of northwestern Montana, and the dark insular social landscape which to this day lurks close to the surface, is absolutely dead-on. As a social worker in NW Montana for the last four years, I’ve given up discussing details of my job with just about everyone I know or meet. Most wouldn’t believe a lot of it if I told them, and I wasn’t surprised to hear, in an interview with NPRs Robin Young, that Henderson choose to dial back some of the details around which he built his book. The gasoline huffing runaway who ends up in Pine Hills (youth prison) after being sexually abused by his drug addicted mother and beat up by his social worker, and the paranoid man who retreats to starving in the woods after his wife commits uncomprehensible violence have two things in common; they’re both characters in Fourth of July Creek, and it is entirely probable that their real life equivalents are alive in this place right now. You need a good reason to live west of the mountains and north of the bastion of civilization that is Missoula. Whenever I meet someone, either for work or socially, I ask why they ended up here. The winters are dark and foggy, the weather unpredictable year-round, and the brightest months of the summer overrun with tourists who most often act like a different species. Trappings of culture and conveniences like multiple places to buy pants and shoes are modest, especially compared to the traffic. And that’s in the Flathead valley where I live, the most populous and brightest region of northwestern Montana. Here we’re surrounded by darkly timbered tendrils of the Pacific Northwest, but have the harsh sun, wind, and open spaces of the Continental Divide almost within reach. Northwest Montana proper is further west, in Lincoln County, where most of Henderson’s novel is set. Lincoln is given over entirely to deep river valleys and thick forests, broken only very rarely by bare alpine basins and small towns. While the population of Flathead County has tripled since 1960, that of Lincoln has not even grown 10%, and suffered a significant dip during the 70s and 80s (the novel is set in 1981) as the logging and mining upon which the areas population came into being saw a vast reduction in scope and productivity. 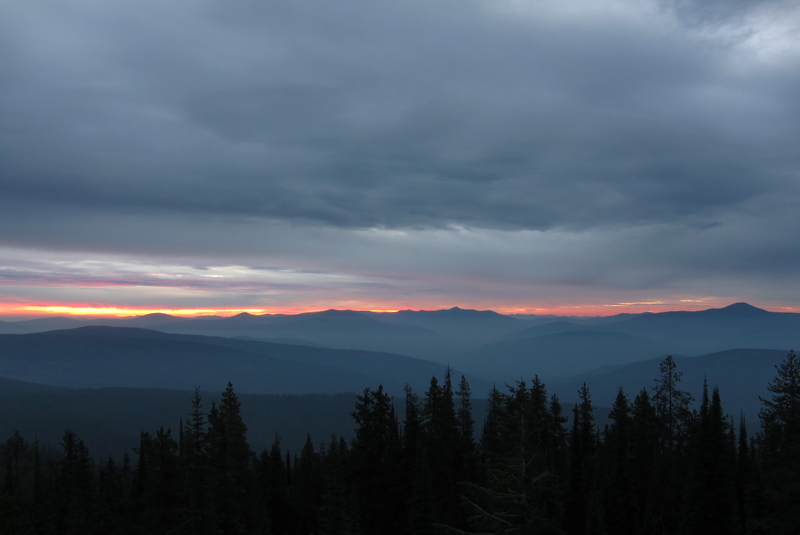 The central Yaak, looking east-northeast towards the Whitefish Range, Eureka, and Canada. This is country Jeremiah Pearl, anti-hero of Fourth of July Creek, knew well. This heart of northwest Montana is a place at once huge and small. It takes a discerning soul and more time than most are willing to give to see the differences between the monolithically green ridges, and even from a high place the long views mainly show you just how much you can’t see. As Henderson emphasizes again and again, it is a good place to hide from the world. Fourth of July Creek’s protagonist, Pete Snow, has a good reason for living in the lower Yaak, near the fictional town of Tenmile (a proxy for Libby, the county seat). His marriage fell apart under circumstances he ultimately chose to not control, so he applied to be transferred up to what remains one of the least desirable postings at Child and Family Services. There he can live in a small cabin, do enough work to fill his hours and satisfy his conscience, commune with other men who have made similar choices (be they loggers of judges), and rarely have to answer questions. Pete’s worldview is shaken when a mysterious boy, obviously feral in a somewhat pre-modern sense of the term, appears at the local school. Social workers are in the book, and remain today, fixers when no one else knows what to do, and thus Pete is called in to do the more complicated things, beyond medicating the boys malnutrition. And thus the reader is drawn into the life of Jeremiah Pearl and his son Benjamin. Pearl is a northwest Montana legend, someone who did what many of the hard-bitten, taciturn, independent men (and the full characters are almost all men) of the region have thought of but always shrank away from: going fully away from society and living all the way in the woods. Having a cabin with an outhouse and no running water, and perhaps doing some spring deer poaching, is one thing. Giving up your truck, whiskey, and deliberately chosen ties to society is quite another. People come to northwest Montana, as both Pete and Jeremiah did initially, to place the world at a controllable distance. To refute it entirely, as Pearl and his son do, is a categorically different step, and one worthy of inevitable suspicion. If you’re in a bar in Missoula and can explain your residence in Lincoln County as having to do with a dedication to hunting, fishing, skiing, and writing, it is a comprehensible, even admirable, choice, if still eccentric. Some underlying wound is nonetheless supposed to fully explicate the anti-social behavior. Pete, and the other men who inhabit Henderson’s Tenmile, recognize and accept antisocial choices, but still Pearl’s life is one which makes them uneasy. In the end, the novel confirms this suspicion. Pearl believes in the end of the world, and has prepared for it with huts full of venison and ammo, and a life designed to place him beyond the knowledge of governments. He may have started down this path out of unique or idiosyncratic beliefs, but was in the end driven to fully inhabit it by family trauma so horrific that by comparison rationality is a frail and abstract construct. Pearl’s wife, whom he loved dearly despite mental illness, and all of their children but one contract an illness from ice chipped out of neighbors freezer and made into snocones. Rather than go back into civilization and seek medical attention, Pearl’s wife shoots her children, and then herself. Awful things happen in the world everyday; more often than we realize they happen in our own cities and neighborhoods. American society is tasked with balancing respect for adult decision-making, even choices seemingly made with self-destruction in mind, with enforcing rules which will contain society and enable it to move forward into future generations. Pete Snow lives this contradiction. His alcoholism affects his job performance, to varying degrees, but his is still competent and well intentioned, and most importantly willing and capable of bringing consistency to a job where that trait is both important and usually in short supply. He is forced to grapple with the paradoxes of his profession throughout the novel. He breaks the rules, letting the aforementioned gas huffing abuse victim free to live with friend he made on the street, and then letting Pearl and his son go as well. Pete sees himself in both of these cases, he is forced to when his own daughter runs away and eventually becomes embroiled in street life as a prostitute. Pete is only one small step, one routine twist of fate, away from sliding into criminality himself, from becoming one of the people whom he is paid by the state to police. He is far from the best equiped to deal with the situations in which he finds himself by novel’s end, but neither is he the worst. How far does he succeed? Henderson properly leaves the reader questioning, and for that, and writing a novel which resonated so well with me personally, I thank him. I just finished the novel a couple days ago, and was really impressed by it too. I was amazed by how complicated and true all of Henderson’s characters seemed. The fact that he could make Pearl or Cecil so sympathetic says a lot about his skill as a writer (I was reminded of an interview with Gabriel Garcia Marquez in which he was asked what the critics had consistently missed about his work, and he responded something to the effect of ‘the great sympathy of the author for all his characters’). I’m not familiar with NW Montana, so it’s cool to see from your post how the novel fits into real world geography. BTW, I’ve been enjoying your posts for several months, especially the series about the Grand Canyon back in the spring. Thanks for taking the time and effort to write them up. Bought the book on the strength of your review Dave, and am currently about one hundred pages in, enjoying it immensely. Thanks for the recommendation! If you’re interested in any antipodean literature, I think you’d like the novels of Richard Flanagan. Similarly to Henderson, Flanagan also deals well with challenging social themes in evocative and interesting environmental settings (mostly Tasmanian). Available through the usual sources; just a thought. Cheers, J. Thanks John, gad you’re enjoying it. Will look into Flanagan; we’ve got a 1400 km drive down to Utah next week so entertainment is in order.